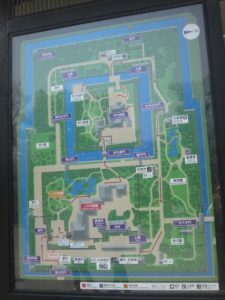 From this Website: Nijo Castle was built in 1603 as the Kyoto residence of Tokugawa Ieyasu, the first shogun of the Edo Period (1603-1867). 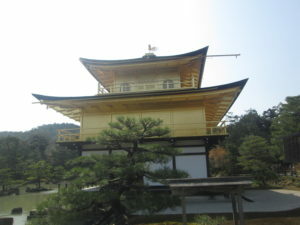 His grandson Lemitsu completed the castle’s palace buildings 23 years later and further expanded the castle by adding a five story castle keep. 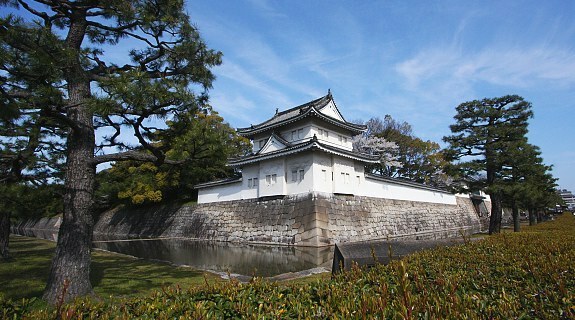 A castle is a defensive structure built to defend against enemy attack. 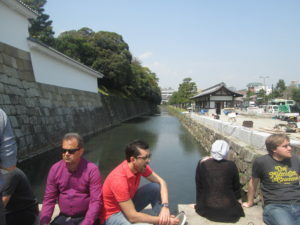 From ancient fortresses and castle towns, feudal lord residences and hill castle or forts of the Middle Ages, or also temple towns surrounded by a moat to fortresses built in various places at the end of the Edo Period (1603-1868), the word castle includes many meanings. 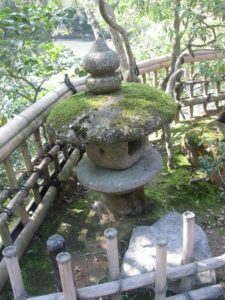 From all of these, the majority of castles regarded as castle-like were those built in the almost half century from the end of the Warring States period, through the Azuchi-Momoyama period, and into the beginning of the Edo period. 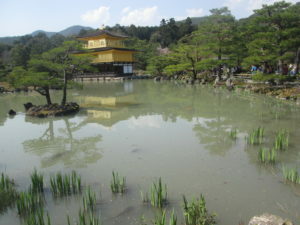 During this period the number of big and small castles in Japan reached over 3,000. 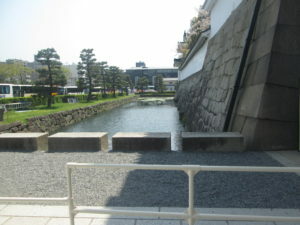 However, following the summer campaign of the siege of Osaka in 1615, the Tokugawa Shogunate instigated the ‘law of one castle per province’ and the number of castles quickly fell to just 170. 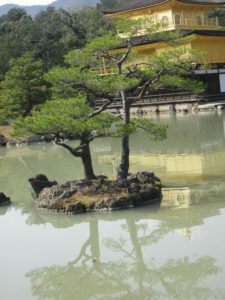 Following this, the construction of new castles and the restoration of old ones were prohibited without permission from the Shogunate, and as such the number of castles did not change much as Japan headed into the Meiji Restoration (1868-1912). 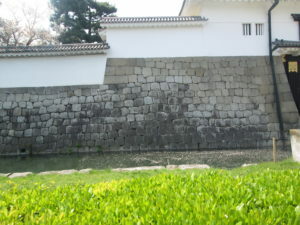 As the rule of the samurai came to an end in the Meiji Restoration, the new Meiji Government released the ‘order for abandoning castles’ in 1873, and by around 1874 or 1875 about two thirds of Japan’s castles had been demolished. 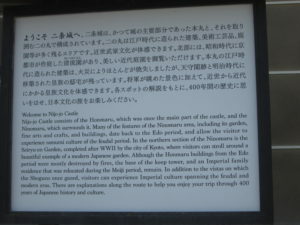 Following this, many castles suffered great damage during World War II. 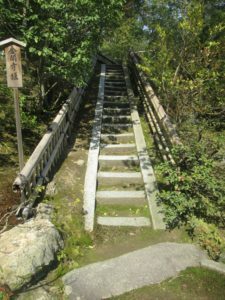 After the war, the historical value of Japan’s castles was reconsidered, and as an outstanding sightseeing resource many castle towers, turrets and castle gates that were lost to fires were reconstructed or restored. 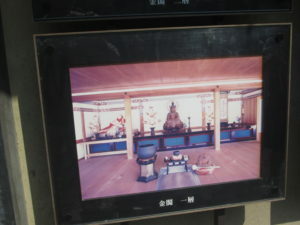 The photo above says: Welcome to Nijo-jo Castle. 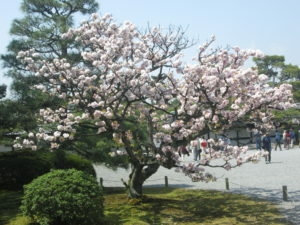 Nijo-jo Castle consists of the Honmaru which was once the main part of the Castle and the Ninomaru which surrounds it. 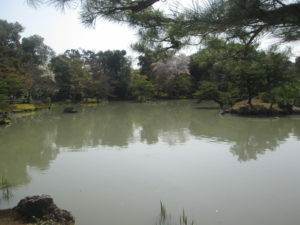 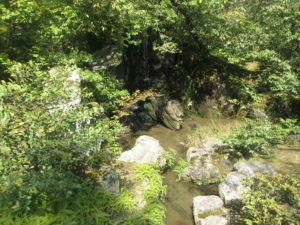 Many of the features of the Ninomaru garden, fine arts and crafts and buildings date back to the Edo period (1603–1868), and allow the visitor to experience the samurai culture of the feudal period. 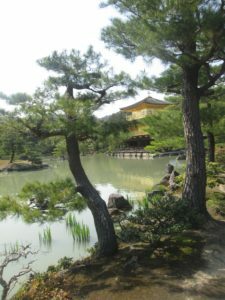 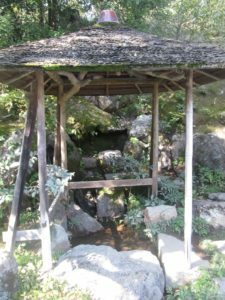 In the northern section of the Ninomaru garden is the Seiryu-en garden completed after WWII by the city of Kyoto where visitors can stroll around a beautiful example of a modern Japanese garden. 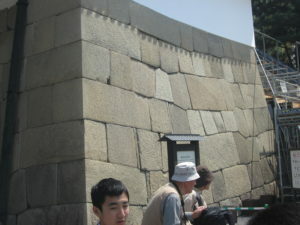 Although the Honmaru buildings from the Edo period were mostly destroyed by fires, the base of the keep tower were relocated during the Meiji period remain. 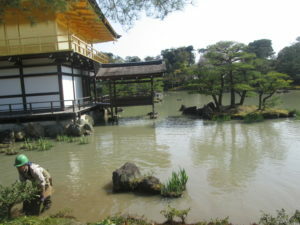 In addition to the vistas on which the shoguns once gazed, visitors can experience the feudal and the modern eras. 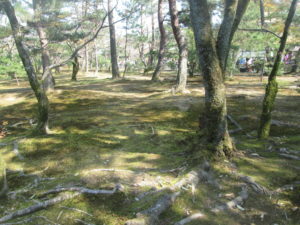 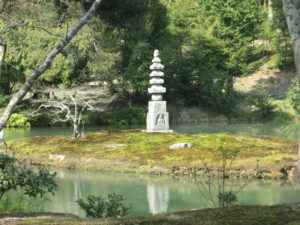 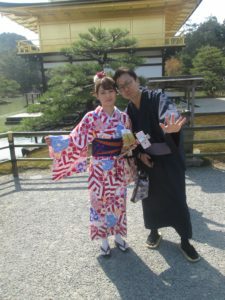 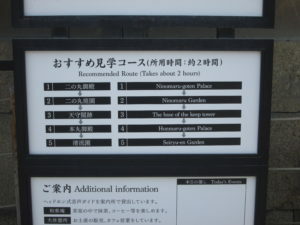 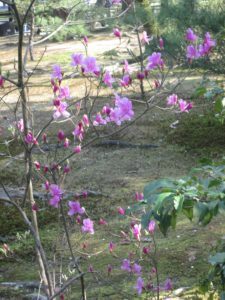 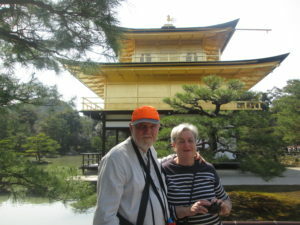 There are explanations along the route to help you enjoy your trip through 400 years of Japanese history and culture. 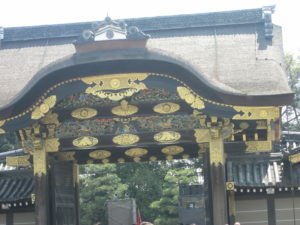 This is the main gate of Castle Nijo-Jo. 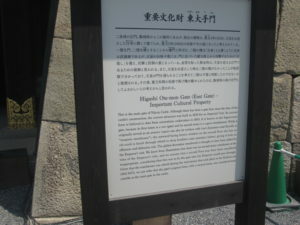 Although there has been a gate here since the time of the castle construction, the current structure was built in 1626 for an Imperial visit. 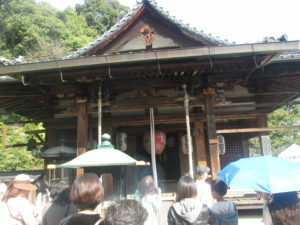 Its current form is believed to date from the renovations undertaken in1663. 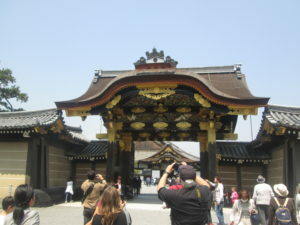 It is known as the Yagura-mon gate because its 1st storey is a mon (gate) and its 2nd storey is a yagura (watch tower). 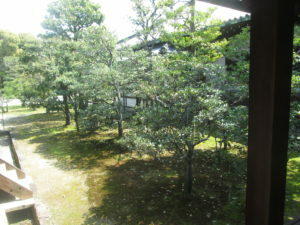 While served as originally served as an armoury (yagura can also written with Kajjn characters read literally as ’weapons storehouse’. 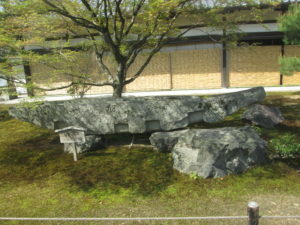 The outward facing lattice window on the 2nd floor also has an ishi-otoshi (a hatch through which to drop boulders onto attackers below) giving it both offensive and defensive roles. 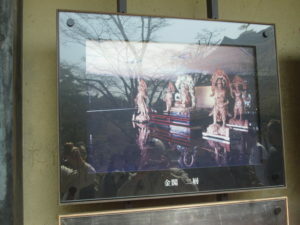 The gilded decorative metalwork is thought to have been added for the Emperor’s visit. 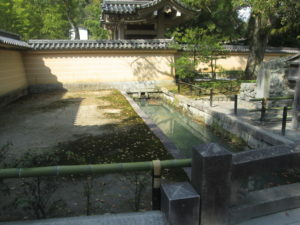 We know from illustrations that there was no 2nd storey watch tower at the time of the Emperor’s visit and we assume that the 2nd floor may have been considered inappropriate, considering that this was to be the gate through which the Emperor would pass through. 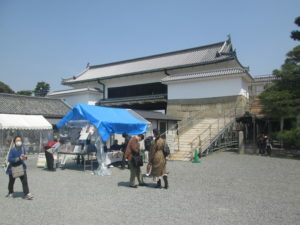 Given that the watch tower was rebuilt during the renovations that took place Kanbun Era (1661 -1673), we can infer that the gates original with a 2nd storey, was considered most subtle as the main gate to the castle.